Please check this list of Safe Places to Dine. If you have places to add to the list, please do send your comments. This is critical for the well-being of the multitudes impacted by the deleterious effects of CFLs and their emissions. Thank you for sending in names. Let’s keep it growing! Please patronize and thank the management of these fine establishments for making/keeping them safe. As you browse the list of Safe Places to Dine, it is apparent that Safe Lighting is a fast-growing trend among successful restauranteurs. If your establishment is missing from the list and has Safe (non-CFL) Lighting, please do let us know and you will get well-deserved credit on this website. Please Note: cflimpact.com is privately-owned and financed. It is a privilege to give you a free listing as a way of saying “Thank you for caring”. You have earned the respect and patronage of the many who are looking for Safe Places to Dine. CFLImpact.com is privately supported and neither seeks nor accepts any remuneration for the efforts and monies expended. This website exists for you, all of you, who have hidden disabilities which are impacted and/or exacerbated by exposure to the deleterious emissions from CFL lighting. Your help in updating this listing is much appreciated by all who use it as a reference to find Safe Places to dine or stay. If you own or operate a place of public accommodation which has safe (non-CFL) lighting, please send a comment with the name and location of your establishment. This website is the place where you will get the credit which you deserve for your consideration and concern. Taco Bell, 2140 W. Galena Blvd (now serving breakfast). Claddagh Irish Pub & Restaurant, 1702 Commons Drive, Geneva, IL – Good pub grub and good service in a safe, CFL-free environment. Burger King, 959 S. Randall Rd., St. Charles, IL (another fine example of Burger King management’s concern for the safety of their patrons). Burger King management, please take note that a large number of your Greater Chicago restaurants are NOT safe – they have CFLs. A remodeled Burger King, on Washtenaw, in Ann Arbor is no longer safe. Jimmy John’s, (All new LED lighting Congratulations) 1502 W Maumee St. Sauce Italian Grille & Pub, 149 N. Main St. (Phone: 517-759-4757). (A great place to enjoy excellent Italian cuisine). Senorita’s Mexican Restaurant, 1325 N. Main St.
Tim Horton’s, S. Main & Beecher (A Canadian icon, with great coffee, too). WOW Cafe’ & Wingery, off Charles Street, over-looking Arrington Arena on the Adrian College Campus. Culver’s, 5910 Jackson Road. (Gotta try the Rueben sandwich). Metzger’s, an Ann Arbor tradition, 305 N. Zeeb Road, at the NW corner of the Zeeb Road – I-94 exit. Pizza House, 618 Church St., on the U of M Campus (an up-scale pizza place) and “Safe”, also. Red Robin, 3797 Carpenter Rd, (Pittsfield Twp). Taco Bell, 5650 Jackson Rd. Burger King, 1250 McDevitt Ave., (Vandercook Lake) Thank you for removing the CFLs. It is now safe. Coconuts, 4321 Michigan Avenue (US-12); Great Key West cuisine (Closed January, February, & March). Do try it. Chili’s, 6505 Centers Drive, just West of US23, Exit 8 – good food, superb service, and a “safe” place (Re-opened, all new, 12 February 2015). A huge “Thank You” to the management of Weber’s Inn, 3050 Jackson Road, Ann Arbor, MI. In addition to being CFL-free, and a safe place for the multitudes who have medical issues with CFLs, they also offer four-star dining and lodging. CONGRATULATIONS for being aware and concerned. Evans Street Station, in Tecumseh, MI, is another notable addition to the list of Safe Places to Dine. Thank you for providing an exquisite dining experience and Thank You for caring. Danley’s Country House is another addition of note, to the list of Safe Places to Dine, in the Tecumseh, MI area. Thank you for making your friendly place available to the many with “hidden disabilities”. Another “Thank You” to Metzger’s, an Ann Arbor, MI tradition. 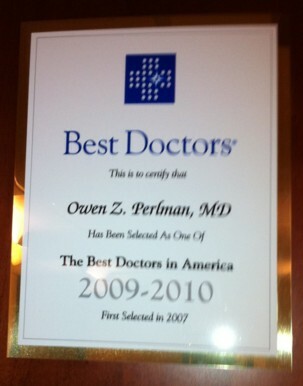 Located at 305 N. Zeeb Road, on the NW corner of the I-94, Zeeb Road exit. They, also, are CFL-free and provide a very interesting selection of German food, made the way a German grandmother makes it. Thank you to Burger King management for their concern about the safety of their guests with hidden disabilities. As more reports come in and we travel to more places, Burger King is leading the way with safe, clean lighting. Congratulations for your Corporate Concern. You deserve the business of appreciative guests. More managers are telling us that they have converted from the harmful CFL’s to LED’s. Burger King gets the vote for the best fast food and the safest lighting. Burger King has, once again, set the standard a bit higher. Thank you to Burger King management in Adrian, MI, on N. Main for using LED exterior lighting. Burger King management, please note that a substantial number of your Greater Chicago area establishments have CFLs. Please do take a clue from your Ohio and Michigan counterparts and convert to “Safe” lighting. Thank you, also to The Hunt Club, of Hillsdale and Jackson, MI for offering excellent food and safe lighting. Congratulations and thank you to the management of Bob Evans Restaurants. In recent weeks, numerous Bob Evans Restaurants have been reported to have changed to Safe Lighting. This lists enumerates the ones which have been confirmed to have updated. Your spirit of co-operation and concern for those with hidden disabilities is deeply appreciated. A leading Physiatrist, Owen Z. Perlman, M.D., has stated that he believes there are more people affected by the deleterious emissions from CFLs than are in wheelchairs. Your caring and concern broadens the marketplace for your fine vittles. It is fun to, again, enjoy the hospitality of Bob Evans Restaurants. Check out the WOW Cafe’ & Wingery, in Adrian, MI. It is adjacent to Arrington Ice Arena, on the beautiful campus of Adrian College. Thank you for being sensitive to the lighting issues thereby allowing folks with hidden disabilities to enjoy your establishment. “Also, the Marriott hotels in general have been helpful in disability reasonable accommodation requests prior to reservation to change at least a portion of room lighting to alternative to florescents, such as warm LED, natural light, decorative clear or pink incandescents 40 watt, which are still available for purchase under one of the exceptions. Thank you to UNC Mom, for her encouragement, help, and suggestions. If clothing or bedding materials come in direct contact with broken glass or mercury-containing powder from inside the bulb that may stick to the fabric, the clothing or bedding should be thrown away. Do not wash such clothing or bedding because mercury fragments in the clothing may contaminate the machine and/or pollute sewage. Shut off the central forced air heating/air conditioning system, if you have one. Promptly place all bulb debris and cleanup materials outdoors in a trash container or protected area until materials can be disposed of properly. Avoid leaving any bulb fragments or clean up materials indoors. If these bulbs are so “safe”, why do you have to go to this extent to clean them up? Why did the “instructions” change after the election? “Installed horizontal for about a year” is the report which came with this photo. It was removed from a home in Loiusville, KY.
Is that the UL label on the right side, about an inch from the burned area? Hmmm. If you find this to be an acceptable failure mode, and if you do not care about the people around you, then go ahead and convert to CFLs. Better yet, call your Congressman and Congressman Fred Upton, Chair of the Energy and Commerce Committee, at Phone: (202) 225-3761. He said he’d repeal the incandescent ban. Perhaps we need to remind Congress of the “WHY”. 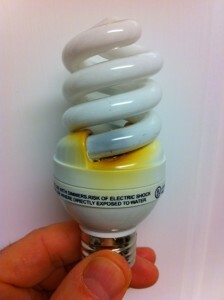 Please see the EPA “Suggestions” for Cleanup of a Broken CFL, in the “Posts”. Be sure you read the part about throwing away your clothes if they have any particles on them. And these are harmless little Green Wonders? Not. To view this interesting video done by Allison Vuchnich in Geneva, please check the first Video near the bottom of the Home Page. Perhaps you are already aware of the serious medical issues which are presented by the spurious emissions from CFL bulbs. If not, please do read this. Dr. Owen Perlman, a prominent Physiatrist affiliated with Associates in Physical Medicine and Rehabilitation, at the Reichert Health Building of St. Joseph Mercy Hospital, which is located between Ypsilanti and Ann Arbor, MI, is sure that there are more people impacted by CFLs than are in wheelchairs. At this point, it is not known whether it is the Critical Flicker Frequency of the light, the RFI, the EMI, or some combination of the above which wreaks havoc with many thousands of people with an array of ailments ranging from Migraines, Epilepsy, Multiple Sclerosis, Dizziness/Vestibular Problems, Seizures, Nausea, and Cardiac Arrhythmias, to Autism, Head Pain, Acquired Brain Injury, ADHD, Scotopsia, Electromagnetic Field Sensitivity, Depression, Difficulty Concentrating, Pain in Teeth, Pain or Pressure in the Chest, Pressure In/Behind Eyes, Ringing in the Ears, Tingling, Shortness of Breath, Weakness, Spike in Blood Sugar, Diabetes (type 1 and 2), CFS/Myalgic Encephalopathy, Photosensitivity (Critical Flicker Frequency). The Videos and Studies on this website will show you some of the effects discussed above. Allison Vuchnich, of GlobalTV, in Toronto has won a Gemini Award for her recent documentaries on the effects of CFLs including the recent research that is being done in Switzerland. The Swiss researchers have built an environmental test chamber which allows them to measure the deleterious emissions from CFLs. Their preliminary conclusion is that the standards set by the U.S.A., Canada, and the E.U. do not sufficiently protect the general population from the medical damage inflicted by CFLs. Their experiments show the Central Nervous System of people with electrical sensitivity as it is “hit” by the radiation from the CFLs. It is hoped that a copy of that Video will soon be available at this website. It is quite scary. For anyone who may be unaware of the medical issues caused/exacerbated by CFLs, the question still remains “Does any place of business want the liability of the contamination caused by the breakage of a CFL?” The June 2010 EPA “suggestions” for cleanup of a broken CFL is in the column to the right. The liability issues of having to evacuate a building and doing the suggested cleanup of a hazardous material would effectively close a business establishment at least until the cleanup was completed as delineated in the EPA “suggestions”. As noted, the liability could extend to new clothing for occupants of the building, or perhaps even something more serious. 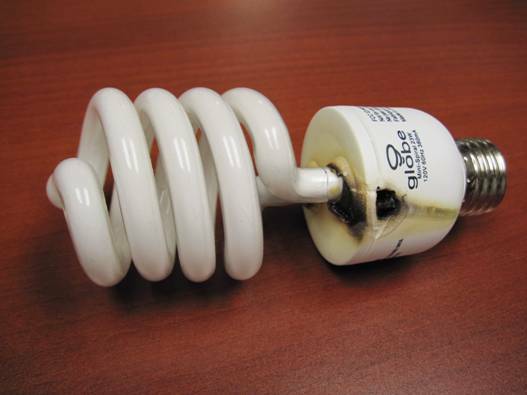 CFLs can pose a major potential liability for your firm should one be broken and contaminate your facility. CFLs pose many serious medical problems for large numbers of people. A prominent physiatrist in Ann Arbor says that he is certain that more people are impacted by the deleterious effects of CFLs than are in wheelchairs. They simply have yet to make the connection. Based upon these statements, it would be reasonable to assume that, should this occur in a place of public accommodation (such as a restaurant) the establishment would effectively be put out of business until a proper job of cleanup is accomplished. How many restaurants can afford that disruption? Why do local health departments allow CFLs in restaurants? Why would any owner of a place of public accommodation subject themselves to the potential liability exposure caused by such an event? The Canadians are way ahead of us on this issue. Dr. Magda Havas of Trent University in Peterborough, Ontario, has been on this topic for several years. Her research shows that one CFL contaminates 190,000 litres (more than 50,000 U.S. gallons) of water beyond the level considered safe for drinking. Swiss research indicates that the UV emissions from CFLs pose a health hazard and that government standards are inadequate to protect us. We wear sunglasses for UV protection when outdoors. Why would we have a light bulb producing harmful levels of UV in our homes? Our EPA has failed to protect us. Let’s support elected representatives who want to restore our choice and protect our health. “Below is a picture of a CFL light bulb from my bathroom. I turned it on the other day and then smelled smoke after a few minutes. Four inch flames were spewing out of the side of the ballast like a blow torch! I immediately turned off the lights. But I’m sure it would have caused a fire if I was not right there. Imagine if the kids had left the lights on as usual when they were not in the room. I took the bulb to the Fire Department today to report the incident. The Fireman wasn’t at all surprised and said that it was not an uncommon occurrence. Apparently, sometimes when the bulb burns out there is a chance that the ballast can start a fire. He told me that the Fire Marshall had issued reports about the dangers of these bulbs. Upon doing some Internet research, it seems that bulbs made by “(Brand name omitted)” in China seem to have the lion’s share of problems. Lots of fires have been blamed on misuse of CFL bulbs, like using them in recessed lighting, pot lights, dimmers or in track lighting. Mine was not in any of those. It was a normal light socket. I bought these at (major retailer). I will be removing all the (brand name omitted) bulbs from my house. I have not decided yet if we are going back to incandescent bulbs at this point.